Jordan launches her book with coffee and an intimate chat on Friday evening at Otter Books in Nelson and Saturday evening at Café Books West in Rossland, 7 p.m—or 6:50 to catch the photos of professional photographer Larry Doell who joined one of her trips in 2000. Her heart was won in the 1950s when, as a pre-teen growing up poor in the Florida Everglades, she fell head-over-heels in unrequited infatuation for a handsome Cuban sign painter. But that's another story. She first set foot in the country in 1996, and it's clear her love for it has only grown deeper and more complex with every visit she's made since. Derek Choukalos, Jordan's partner and frequent cycling pal on her exploits, supplies two quotes to the book, both memorable. Here's one: "Cuba seems to have the lowest ratio of assholes to humans of any place I've been." I'll say it, and nobody's paying me a cent to do it: this book's a perfect stocking stuffer for the season of selfless values. I've read a bit about Cuba—particularly on the difficult (but spectacular) organic agriculture revolution and other Special Period challenges that gripped the nation by necessity after the Soviets suffered death throes in 1989—but none of it holds a candle to Jordan's book for the easy contentment of the read: sensitive, observant, compassionate, unobtrusively informative, and engaging. I lack personal experience, but I'll agree with David Stanley, author of Lonely Planet Cuba, who wrote, "Rosa Jordan will introduce you to the real Cuba." Not that the "real" Cuba is even possible to define, as Jordan is the first to admit. But true to the book's title, for a country whose image has been spun like a top, she offers a fresh vision as we join her cycling 5000 kilometres of coastline, meeting regular folks and hearing stories that quickly unravel a half century of vitriol hurled against Cuba by its former colonial master. The effort that the American government and media have expended to demonize Fidel Castro and undermine the island's socialism always struck me as vapid. Was this the same America that—when it suits their commercial needs—props up, arms, trains, and otherwise creates evil dictators the world over? And hang on, what's criminal about being the world's largest supplier of doctors (100,000 in more than 100 countries), eradicating illiteracy and extreme poverty, supplying free post-secondary education and international scholarships to the best students, providing affordable housing and free all-expenses health care? Cuba cared for more children following the Chernobyl disaster than the G-8 countries combined, trains new doctors (160,000 at present, from more than 80 countries), and has healed more than 1.5 million Latin Americans of cataracts. Doctors may get $30 a month, a ration card, and live in a simple house much like everyone else in Cuba, but what's the big deal? Almost everything else is paid for. And most of these doctors believe in service to others, as did the founder of Cuba's universal health system, Dr. Che Guevara. Having made my own bias perfectly clear, don't worry that this book is some glowing endorsement of all things Cuban. Jordan peers unflinchingly into all Cuba's realities, from what she perceives to be great, bad, and confusing, from hurricanes to homosexuals, from prostitution to the new shoots of other (if less ancient) businesses growing up through the cracks in the anti-business communist ideology. Recounting her backroad exploits, she explores Cuba's errors head on, such as the hobbling failure (until recently) of laws blocking small enterprises. But since the fallout from the loss of the USSR—and so the loss of subsidized fuel and farm inputs, the loss of a guaranteed price for large quantities of sugar, and more effects that crushed the Cuban economy—Cuban leaders were forced to regroup and recognize around the wisdom in cottage industries, farmers markets, cooperatives, B&Bs and other elements of small-scale enterprises. There's no perfect solution. Jordan also explores a curious form of racism—the result of historic trends, not emotional hatreds—that has spontaneously emerged with the new entrepreneurial class. She also criticizes the crippling effect on the homefront caused by overseas adventurism to overthrow oppressive regimes—no matter how warranted it may have seemed at the time—for example in Ethiopia and Angola. But for twenty years Cuba's military has only been used for defence. Unfortunately, the myths persist of Fidel the iron-fisted dictator, of a Stalinesque police state, of Cubans who live in deplorable conditions, hate the revolutionary leadership but aren't permitted to leave, and all the rest of the worst that "the west" has been taught to believe. Jordan takes these myths apart gracefully, allowing for many perspectives in her captivating stories. My own investigations into Cuba, past and present, convinced me long ago that the American media's pack of lies were concocted by an imperial power whose ego was terribly bruised when this island, on its own, booted them out and kept them out, despite money and arms to a propped up dictator before, and despite invasions, embargos, and assassination attempts since. What's a bully to do but spit? Historically, Cuba seemed doomed to the same tragic fate of its Latin neighbours, most of whom suffered terribly at the hands of Spaniards (or Portuguese, or French), and later had any chance for democracy and real independence ripped out from under them by the United States in collusion with wealthy locals. Cuba went a long way down this path. After the indigenous Taíno people were eradicated or absorbed short decades after Columbus landed there, the Spanish colony became populated by slaves and their owners to produce raw resources, especially sugar and rum, for European markets. The Spanish-American War in the waning days of the 19th century replaced one overlord with another, and American business consumed the island and propped up a handful of wealthy Cubans who treaded hard on the majority—the filthy poor. The injustice and disparity was more than some could take, revolution fomented, and against all odds the US puppet dictator Batista was overthrown. One thing I love about Jordan's stories is the new history she's drawn from her encounters with everyday Cubans who were there at the time, for example a park caretaker who had met Celia Sanchez—the revolution's true mastermind, not Castro as is widely believed—as she dwelt in forest glens and contemplated a more just and humane future for her country. Jordan steps much deeper into Sanchez's life in her novel, The Woman She Was. Jordan cycles us past Guantánomo Bay, where the US maintains it's illegal naval base and detention centre as a relic of its colonial days. We spend time in the Bay of Pigs where President Kennedy had the CIA stage an invasion of disaffected, wealthy Cubans from Miami—it was soundly defeated when the local population rose up against the invaders in support of their beloved Castro, completely against the expectations of the CIA. Rather than go on about the often counterintuitive and "upside-down" approaches Cubans take with remarkable success, given both the bullying it's suffered from the US and the rigid ideological stances its suffered from within, let me pass you on: Jordan does it much better. 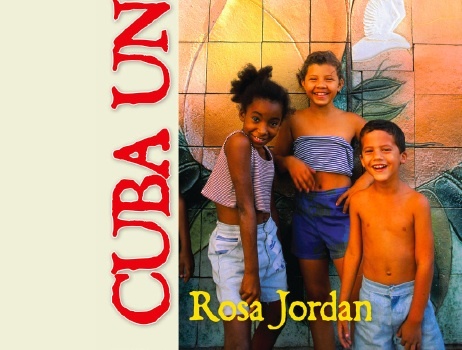 Join Rosa Jordan for the launch of Cuba Unspun at Otter Books in Nelson this Friday and Café Books West in Rossland on Saturday. Both begin at 7, with a slideshow by photographer Larry Doell beginning at 6:50 pm.